A compromise so everyone has a place in the living room! If you have a dog, you may be forbidding him - successfully or not - to lie down on your couch. Or, you give him permission, but he takes your spot! Some people think that to have a piece of furniture that is welcoming to both humans and animals, we must sacrifice the design. Or, that we have to endure a lot of hair on our sofa and therefore, our clothes. But this is not the case! Discover this designer sofa, which hides, in its armrest a mini-sofa for your pet dog! 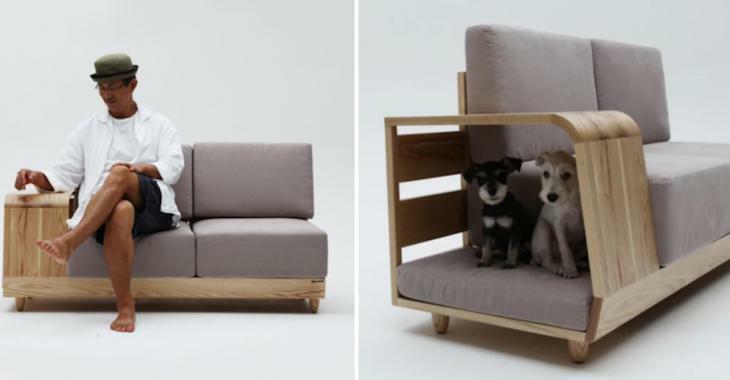 In South Korea, the designer Seuingi Mun has imagined an ingenious sofa specially designed to accommodate your dogs. It includes a mini-sofa intended for our furry companions! A Korean designer, Seung Ji, specializes, among other things, in the creation of furniture for mans's best friend. He had the idea to create a sofa specially designed to accommodate canines. We are not talking about letting your dog get on the couch, but to include a mini sofa intended just for him. Yet the idea is simple: on one of the two edges of the sofa, a small dog house has been integrated. It allows the four-legged companion to settle on a small divan intended just for him. It's perfect for TV evenings, alongside our loving companion! It's like a small luxury indoor dog house for your pet to rest in comfort. And you will notice that you will be able to pet him while watching your favorite series! Maybe you might even drop a few pieces of popcorn to your pet's delight! What do you think of the design of this innovative piece of furniture? Would you like to own one? Ask your faithful companion to see what he thinks! However, nothing can guarantee that your pet will no longer get up on your part of the sofa! It may still be necessary to call on a dog trainer! You should know that the designer Seuingi Mun also creates furniture intended totally to humans but also, accessories for animals only.